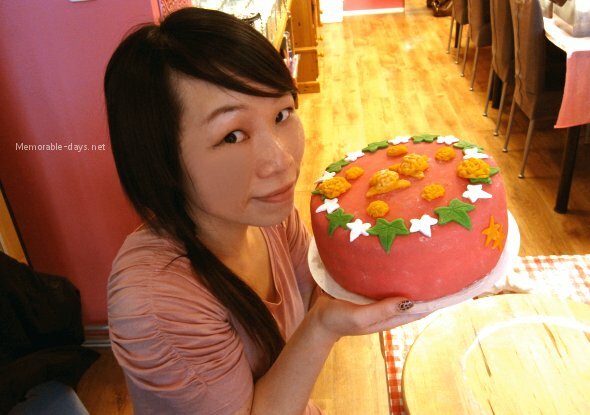 Cake decorating workshop | Memorable Days : Beauty Blog - Korean Beauty, European, American Product Reviews. 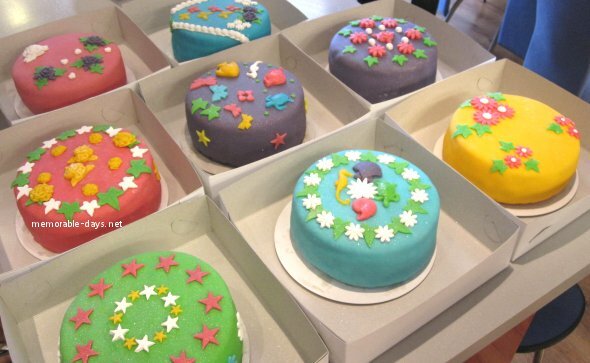 I went to a cake decorating workshop a few days ago with my sisters and a few friends of my sis ^^. Whoa, it was my first time doing something like this and it was harder than I thought. 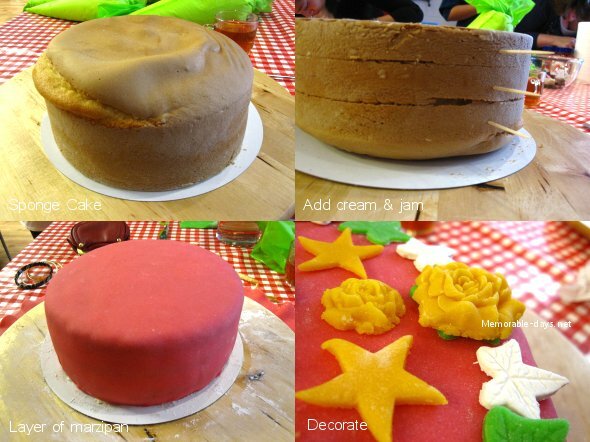 A lot of patience and creativity is needed while decorating a cake. 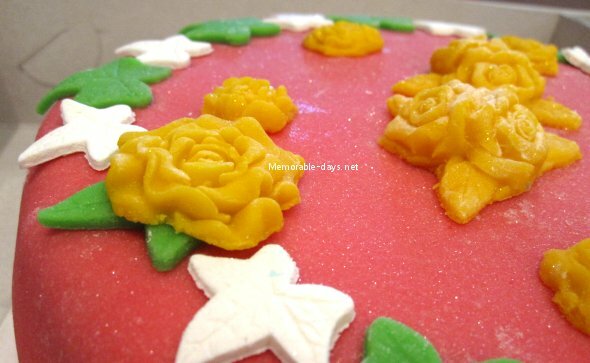 In the picture below I'm holding the cake that I decorated, a cute pink cake with yellow roses and green & white leaves. Lol decorating this whole cake took me around 3 hours xD. It was fun to do this once, but I wouldn't do this again. It's way too expensive and I don't have the patience for it. (Yes, it's expensive, this workshop costs €40 per person). It's not a thing that I would like to do in my free time =/. The cake was already made when we arrived, all we had to do is add some cream & jam and decorate the whole cake. The outer layer and the small decorations are made of marzipan ^^. Adding some decorations~ I'm loving the yellow roses ^___^! Dadadadum~ here is the end result ^^. Do you like my creation? Looks very simple right =p? This took me 3 hours to do x___x"!!!! We all made a cute cake, doesn't it look pretty? It looks so colorful =D! 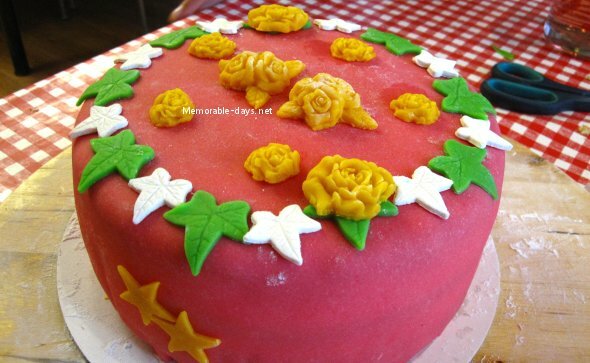 Have you ever decorated a cake like this before? I've never decorated a cake at a workshop. I bake cakes at home sometimes and put the icing on myself, but I've never worked with marzipan. I would really like to go to a workshop like this though, it sounds like so much fun! Thank you anna ^^ !! aww wow thats awesome. it looks so fun! your cake is super cute! This looks sooo fun! I wonder if they have these sort of workshops here when I live! I've never decorated with fondant before because it's super expensive to buy and it looks a bit hard but fun and OH the things that fondant can do is magical!!! oh wow you're really talented. that seems really hard. Ik heb ook een soort winkeltje gezien, die houden ook workshops etc. @Whitney, deze was in rijswijk ;). Er zijn er wel een paar in amsterdam volgens mij, maar nooit geweest xD. i want to do this!!! looks like so much fun! your cake turned out so nice! omg that looks so fun!!! I wanna find one in my area too. It reminds me of cooking mama but in real life! your cake looks delicious! @Mishi, hahaha, it actually is.. but it's way harder than cooking mama on the nds lol =p !! @Madelon, haha it's edible xD!